Most of us have owned a Harmony or Kay during our playing careers – a fondly remembered first guitar, or maybe a good looking but difficult playing, boxy sounding tank. The joke is “It’s a good guitar for slide”, meaning that the action is way too high to play comfortably, but there’s this just below the surface, potentially huge, crude, wooden tone floating around inside. For fleeting moments that tone is apparent, only to retreat into the hollow nether reaches of the box. What if you could get that sound out for all to hear, get it ringing like a 1930s Grand Concert sized Oscar Schmidt Stella and as playable as a 1947 OOO Martin? You’d have it sitting next to you now as you read this. That’s what I do. I guess you could call it a conversion process, although I prefer to look at it as a “releasing the guitar’s potential” process, with some hot-rodding thrown in. Harmonys, Kays, any “second line” brands with ladder bracing, they are the best candidates for this process. A basket case? 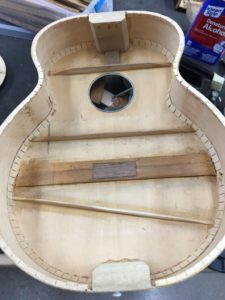 No big deal, I’ve got to remove the top or back to get at the braces inside, so if the guitar is coming apart at the seams already, it makes my job that much easier. I remove the braces, trim them down and configure them more like the old Schmidts, unleashing the sound from the top and back. You won’t believe the difference! There is a lot of structural and playability work to do also, reset the neck, re-enforce it with a carbon-fibre rod, replace the fingerboard with a piece of rosewood or ebony, and refret. A new bridge is usually needed, also fashioned from rosewood or ebony. I also get historic Oscar Schmidts back to playing condition, after 80 to 100 years they are usually ready for a going-over. The process is similar, except their braces are already where they should be and are the correct thickness, but some or all have usually cracked or popped loose. During none of these processes do I mess with the finish, unless some kamikaze repairman has messed it up before I got there.Then I do what I can to get those sections looking good again. A bit of background on how I got involved in all this. I’ve been playing and working on guitars for decades. The first guitars I got some 40 years ago I of course had to take apart to see what made them tick. That got me started. I was always intrigued with Stefan Grossman’s stories about tracking down, repairing and playing old Oscar Schmidt Stellas. They were some mythical entity, something you’d read about or hear talked about, but few seemed to have actually laid eyes on an authentic one. Years later a noted Stella historian turned me on to the wonders, intricacies, quirks and myriad variations of these legendary instruments. I learned a tremendous amount and sold close to a dozen of my rebuilds through him over the course of a year and a half. It was then time to go out on my own. While working on Oscar Schmidts I saw how similar they were to many Harmonys, along with Kays, Regals, etc…same woods, similar crude construction on the inside, nice looking on the outside. But the Schmidts sounded a whole lot better. It didn’t take long to figure out why. There are any number of factors, but the biggest difference is in the bracing. Schmidt braces are trim and widely spaced, Harmony braces are heavy, clunky, and there are too many of them. That got me on the crusade to bring these Harmonys up to something resembling Schmidt standards. You can look at these redone Harmonys as modern Schmidts – the original Oscar Schmidt company went out of business in the mid 1930s. I now convert other people’s guitars and also buy basket cases on spec, then redo and sell them. Violin construction (and ultimately, the sound) has interested me for a long time. Its history also, dating back to the 15th century. Such a small, delicate box with such a big sound! And the woodenness of the tone…absolute perfection. At times I find myself listening to much more violin (also cello and viola) music than guitar music. I’v got an lp of a dozen or so different historic violins being played for comparison, a demonstration record really. A bit of history is noted for each violin. It’s fascinating. Look inside a violin and it’s the opposite of the modern steel-string guitar – simplicity personified, no x-braces, delicate tone bars, sound hole re-enforcement – nothing. A bass bar running longitudinally and a sound post, that’s it. 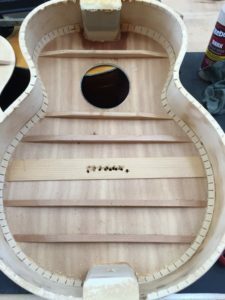 Yes, the design of the ribs is more intricate than the curves of the guitar’s sides, but the inside is still stripped-down simple. So is the inside of an Oscar Schmidt guitar, there is something to be learned from that. Also, the vintage violin market seems to be saner (except for the prices) and more realistic, even more practical, than the budding (in comparison) vintage guitar market. Old Strads that are being played with modern steel strings have been drastically modified from their original configuration. 300 years ago they were designed for sheep gut strings. The neck angle will have been steepened and a stiffer bass bar added. A three centuries old instrument has most likely been dismantled for crack repairs and the addressing of general wear and tear, The bridge will have been replaced. Attention will have been given to the tailpiece, tuning pegs and fingerboard. These old violins are working instruments for the most part, not museum pieces (although some do spend part of their lives in museums). They are meant to be played. So what about guitars that are approaching 100 years old? We’re talking about Oscar Schmidts in particular. Bridges, fingerboards and frets all will have suffered from use. That’s beside the fact that Schmidt didn’t use the hardest of woods for bridges and fingerboards.The original fingerboards were flat, whereas contemporary players prefer a radius. They also lean toward larger frets, a lot larger. What I’m getting at is that an untouched, original Schmidt (or most other makes for that matter) will become rarer or non existent, I don’t think the makers had 100+ years in mind when they made them. Of course, I have no clue what they were thinking all those years ago. As the surviving instruments age, just like violins, they are going need attending to as players. If this work is done by skilled repair persons getting these guitars up and running again, I think the future for these particular vintage guitars (Schmidts but also Harmonys, Kays, etc. brought back to life) will be exciting, interesting, and there will be quality player’s instruments out there for a reasonable price. Bottom line – when all the necessary issues are addressed, these guitars are smokin’ players. They are definitely worth the effort. Most people I hand one of these redone babies to hit a big open chord and go “Wow!” That big, edgy, wooden tone gets to them. These ladder-braced Schmidts are usually described as having a”bark” to them, a sound with a lot of wood that instantly jumps out at you. Imagine being able to coax that sound out of a little more modern Harmony or Kay also. The future is bright, the possibilities are endless.